Blanche de la Force is the leading heroine of the Van le Fort/Bernanos/Poulenc masterpiece, Dialogues des Carmelites. I had the privilege of seeing this at the MET Opera in New York, last week. A sold-out house in the heart of New York City was given to witness a dramatic rendering of a relatively unknown historical episode. The opera lyrically retells the story of sixteen women, twelve of whom were cloistered nuns in a Carmelite monastery in Compiègne in France, who were rounded up, imprisoned and condemned to the guillotine, accused of being a threat to the state during the Reign of Terror. Their martyrdom in Paris on July 17th, 1794, inspired a novel, a play by Bernanos, and the operatic score by Poulenc. Enacted on that stage with intensity, pathos and deep reverence was the modern manifestation of grace in action. Three hours of a haunting score, lacerating storyline, and inevitable tears led to what is considered perhaps the most dramatic ending in the history of operatic masterpieces. It was an experience in understanding the power of grace propelling natural human fear to the heights of courage, sacrifice and holiness. What is it that makes this relatively unknown historical event, and specifically Catholic story, so modernly compelling? Fundamentally, the Dialogues reveal a deep yearning we have for something greater than ourselves. It is the propensity to love beyond ourselves that drove sixteen cloistered women to accept even the guillotine, together. The family of their convent remained intact. In life and in death, they were united. And in that strength of unity, they loved greatly. They loved God personally in their austere life of prayer, and through that love, they were enabled to love one another in the face of the impossible, the radically unjust, the terribly unfair, the ultimate finality. In this act of sacrificial love, repeated similarly throughout the history of persecuted Christianity, there are relevant lessons on despair and death. One of these is that death is an opportunity for union. We often think of death as a separation, and rightly, for there is a physical severance of persons that takes place at the end of a life. But beyond that separation is the possibility for a greater love–a love that bears the imprint of the earthly togetherness and elevates it. The nature of death is such that it enflames restless hearts; it enflames them with love by privation. It propels them to love more intensely what is no longer tangible, visible, physically near. In the intensity they discover the infinite potential of this love, and by that infinity they come to know the eternal orientation it bears and desire union with it. Where the other has gone, we are rarely given to follow. Blanche, on the other hand, followed. She was hiding in a crowd, having run away for fear, beholding her sisters ascend the scaffold in song, and was instinctively propelled to rejoin in that unity of love that was hers by chosen surrender on entering that cloistered life, and became hers by gift, in the unity of death with them. By contrast, our modern age despairs often in the face of death, or worse, chooses death in despair. Often it is not poverty, or the absence of material goods, that drives this despair. It is the excess, the lavish abundance that remains merely earthly and fails to make the leap necessary to become a reflection of that which is virtuous and good; of what is eternal. This is a blindness that seems incurable; an abundance that fails to satisfy, an excessive desire that ends in deflated despair. This same question is also asked of us, in moments of trial, of severance and separation, of privation, of pain and death and grief. These are moments and times when we are given the possibility to enter into the mystery of a radically faithful love; to participate in an eternal Love that manifests itself in suffering, a love wherein the agony and the ecstasy coexist. What emerges from this purifying participation is the progressive transformation of a modern restless heart, the redemption of its despair, the new yearning that finds its ultimate contentment and peace, in union with the God whose restless love will never fail us. Such is the restless Love, worth dying for… Thank you, Blanche. 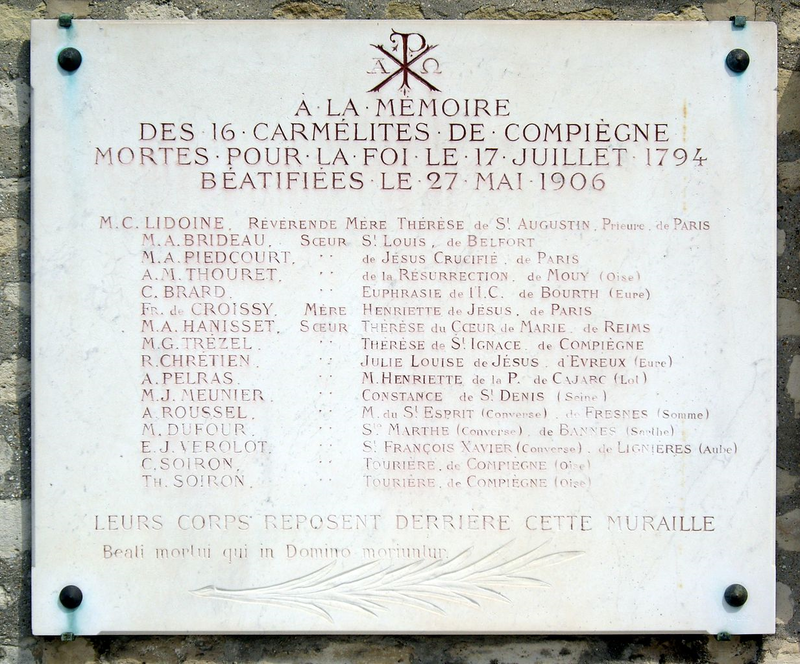 A history of the Carmelites of of Compiègne is titled To Quell the Terror, by William Bush.